But are our feelings alone reliable arbiters? No, because they are often fickle and fallible. Fickle because the things that seem pleasant at one time stop seeming pleasant after some time, as is seen in how people often change their favorites to unfavorites. And fallible because pleasant feelings may well mask unpleasant realities, as when the high of narcotic drugs leads to the low of hangovers, addictions and health complications. No doubt, feelings are important parameters in making decisions. But they don’t deserve monopoly over our decision-making. Why? Because our being is not restricted to feeling alone – it also includes thinking and acting. Authentic spirituality is meant to heal our entire being: thoughts, feelings and actions. Feelings divorced from thoughts and actions are often hallucinatory. 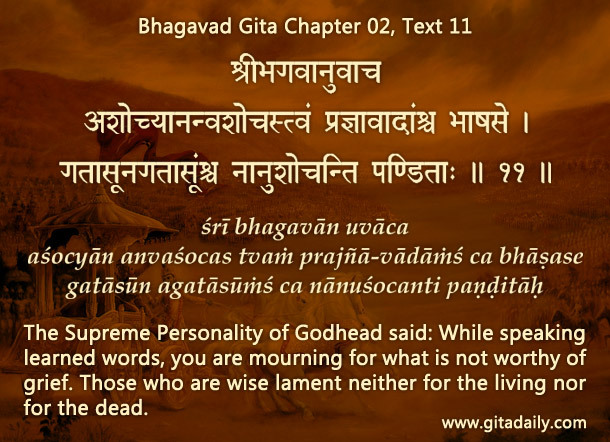 That’s why though the Bhagavad-gita is essentially a book about bhakti, which is ultimately a feeling, it doesn’t waste much time on rhapsodies of esoteric emotions. It centers on rational discussions about practical action. In fact, the Gita (02.11) begins with an unequivocal disapproval of feelings not founded on the truth of our spiritual identity. Thereafter, it gives a philosophical understanding of our identity as souls, parts of Krishna. And it follows up this intellectual illumination with outlines of various forms of yoga meant to harmonize our actions with our identity. When our inner understanding and outer acting are thus good, being in harmony with truth, being in harmony with truth, our true spiritual nature as sat-cit-anand beings surfaces. Consequently, the joy (anand) that is a part of our spiritual makeup manifests naturally. And because this spiritual nature is eternal, these joyful feelings continue perennially, fulfilling perfectly our longing for happiness. Feel-good without think-good and act-good is no good. But the article is very good.